A striking video, recorded by the Wildlife Conservation Society (WCS), has caused the bewilderment among zoologists, as it shows an elephant apparently fuming over its mouth, as if it were smoking , in the forests of the Nagarahole National Park (India). The elephant picks up something from the ground with its trunk, takes it to the mouth and a few moments later spits smoke like someone who smokes a cigarette. The 48-second video showing the scene was recorded by Vinay Kumar, the associate director of the Wildlife Conservation Society of India, in April 2016, during a trip to the forest of Nagarhole, in Karnataka, a state in the southwest of the country. This behavior of the animal has surprised the whole world, and in this way the evolutionary behaviors of the species represent for the scientific community a set of unparalleled knowledge. The scientist acknowledged to the BBC that he had not shared it before because until now he had not been "aware of its importance". And to this day both this expert and his colleague are not clear to what it was that the pachyderm expelled smoke through the mouth. "It is the first time that such behavior has been documented in a wild elephant and scientists are perplexed," says the Wildlife Conservation Society of India in a statement. Kumar explains that he was touring the forest with his team early in the morning to check the traps with cameras they had previously installed to capture images of tigers. And at a certain moment he spotted a female elephant about 50 meters away, so he decided to film it. According to the statement of the society for which he works "apparently the animal ingested coal", product of a controlled fire and "spit smoke". "It really seemed like he was smoking," exclaims Kumar. "He would take a handful of ash to his mouth and spit it out like smoke." 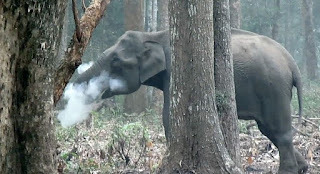 The elephant biologist Varun R. Goswami, who examined the video, believes that "most likely the elephant was trying to ingest coal, after picking up some of the burnt forest floor and expelling the ash, to consume the rest." "Charcoal has the property of absorbing toxins and despite its low nutritional content, wild animals can use it for that medicinal value," he explains. "It can also serve as a laxative, which doubles its usefulness for animals, which tend to consume it after forest fires, whether controlled or caused by lightning."